There was a time, not long ago, when humans ruled the Earth. But all that’s disappeared, along with those people who didn’t accept their new lot in life and went out looking for answers, never to be seen again. The night rules now, and the dark will get you if you aren’t careful. The night never comes into houses though, so people huddle together, cramming into living rooms, bedrooms, wherever there’s space. Windows are papered shut so the darkness won’t seep inside. There’s some semblance of safety in the light, and for two young women, the thrill of venturing out past curfew, jumping between the pools of yellow light cast by streetlamps is too much to resist. The Year of the Rabbit is an interesting example of world building, because the world is not built with description but with fear and the characters’ reaction to fear. 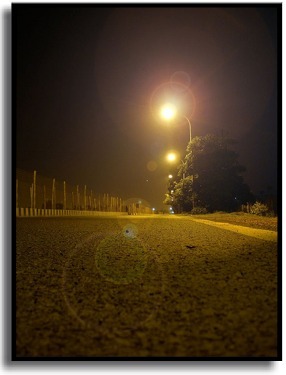 The story starts with streetlamps, or more importantly, the light they emit at night, keeping the dark away. We quickly learn that the night is not safe. The reader doesn’t get a clear sense of what’s going on in the opening scene, but we do know that we should be afraid. The word cues are subtle, but there: “drowning in the dark”, “lights started dying”, “illusion of safety”, “swarming ocean of black”. It’s clear these characters have diverged from our world and have journeyed into one of their own. The world expands some in the following scenes, and we get a glimpse of the park and the city and the streets. The park is so full of light, that even the shadows look friendly, but by now, the reader knows better. The city has been picked clean, wooden garages torn down for firewood, abandoned houses scavenged for blankets and food. And the streets are dark and too quiet, with streetlamps flickering in and out like the dark is trying to catch you. Year of the Rabbit tempts the reader to dangle her feet into the mysterious shadows, and the thrill of the story is well worth it. Wonderfully written, intriguing, and poignant, this story will take you to another world constructed from the fear within. It’s been four years since anyone’s heard from Vittorio, when his gift of fine Veneran chocolates shows up for our narrator’s seventeenth birthday. The box’s contents are quick to ignite unrealized passions and awaken old memories of a kiss shared between the two before Vittorio and his family disappeared without even saying goodbye. Not much is known about the mysterious European city-state of Venera, but our narrator takes it upon himself to find out as much as he can. When he finds a clue — a picture of Vittorio in the coffee table book 1001 Days and Nights in Venera by Petra Maxim — nothing will stop him from reaching this surreal land of decadence and beauty. This story opens with our nameless narrator receiving a box of fine chocolates from his best friend Vittorio, of whom no one’s heard a word from in the four years since he moved away. A photo accompanies the gift, a picture of Vittorio on a colorful rooftop with the Mediterranean in the background, identified as the fabled island state of Venera. The only note wishes our narrator Happy Birthday, and nothing else. There’s a subtle desperation in the narrator’s voice, without being angsty, which hooks me in quickly. Four years and the only thing your best friend has to say is Happy Birthday? Ouch. I’m also intrigued by this fabled island state of Venera. The rest of the first scene reveals more about our narrator, and how broken he was by Vittorio’s sudden disappearance. The taste of vermilion in the gifted delicacies is enough to plunge the narrator into a sensual, tactile fantasy — dreams of the could-have-beens if their friendship hadn’t been cut short, leaving only questions and bittersweet memories. It’s hard not to be pulled into this story with the raw emotions and vulnerability of the narrator sharing such an intimate moment. In the next two scenes, his obsession overruns his life, to the point he gives up thoughts of attending college and his parents threaten to kick him out of the house. Still, his focus stays on finding Vittorio and discovering more about this mysterious Venera. He finally comes across a picture of Vittorio in a coffee table book, and with that clue, he empties his father’s bank accounts and books the first flight to Europe. The stage is set now, a heavily character-oriented piece with a solid motivation. This story is a bit of a tease, lots of questions and no answers. We never get to experience Venera through the narrator’s eyes, and never find out Vittorio’s fate. Venera pushes him away no matter which way he approaches the city. But the fun of it is watching him squirm, seeing the lengths he’ll go through to find Vittorio, and the long shot plans he implements only for a small chance of reaching the mysterious city. The beginning of this story hooked me into the narrator’s plight effectively, and I was more than willing to go on this meandering journey with him.